We launched a great new website for Montlake Financial Services, LLC in Scottsdale, Arizona earlier this year. They provide services for investments, retirement, and financial advocacy, helping their clients reach their financial goals. This new company wanted a clean, professional, and streamlined website that gave them a great-looking and easy to manage presence on the web. The site is also responsive, allowing users to easily browse the site on all devices, and the layout is simple and clean, but easy to expand as they continue to grow. The design has clean lines with a long homepage layout, allowing a lot of information to be present when users first land there. The homepage is organized into sections that have parallax scrolling, a neat background effect that gives it a nice modern look. 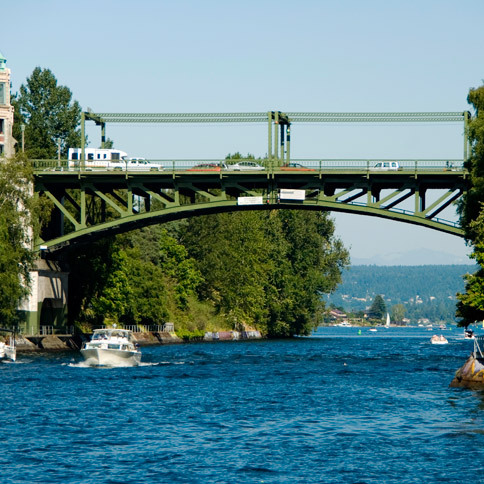 For these homepage backgrounds we chose some business photos and one from Montlake Bridge in Seattle, which is where the inspiration for the company’s name came from. A bold, modern typeface is used for the headlines that make them stand out nicely, which is paired with a modern serif font for the body copy. Black and blue are the main colors in the logo and can be seen throughout the site to give it a polished and professional look. We are a fee-only investment management and financial planning firm that is competing in the financial services industry. We don’t have the budget of larger advisory firms but we knew we needed a professional looking website to gain credibility in our market. Snoack Studios was able to provide us a great looking website at a cost that was within our promotional budget. In addition, we received training from Snoack Studios on how we can make future content updates on our own. During the development process all work by Snoack Studios was done on time and/or when it was promised to us. As we reviewed early drafts of the website, it was easy to communicate requested changes to Snoack and the changes were made timely. If you are a small to medium size business/organization, I highly recommend using Snoack Studios to build your website. Thanks Jon! We enjoyed working with Montlake as well and love how the new site came out. Visit the site to check out their services, and let us know what you think in the comments below!